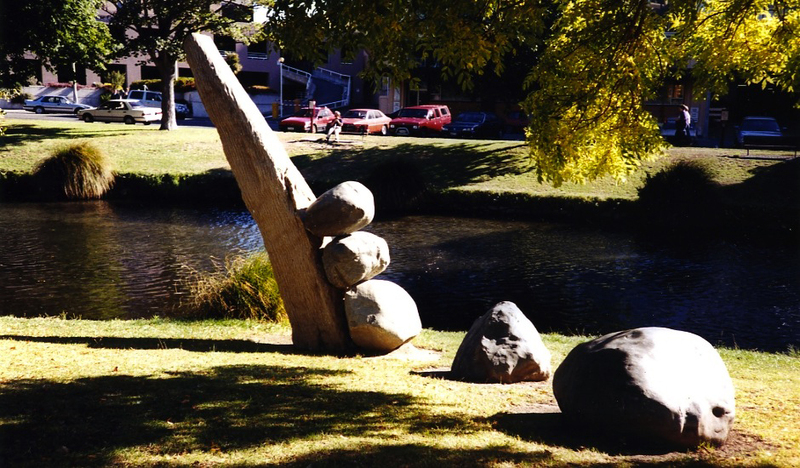 The Kāi Tahu kaumātua Maurice Nutira helped locate the boulders for this project. Waka (canoe) once plied this river, and the form of the sculpture is reminiscent of the stern post of a waka. The land here is an alluvial deposit from the Southern Alps, from where these boulders came. Chief Seattle in his prophecy warned of the fragility of the cycles of nature. Boulders are balanced against the uplifted sandstone slab, recognising that fragility and inviting destruction by man.